What is going on, everybody? It is time to break the silence for my first post of 2017! It's terrible that my blog has been collecting dust, but I just haven't been in a blogging mind for a while. I think I might've mentioned some issues I was going through earlier here or maybe elsewhere so I won't dwell on that here right now. For now it is time to dish out the goods on some anime. Let's get to it. 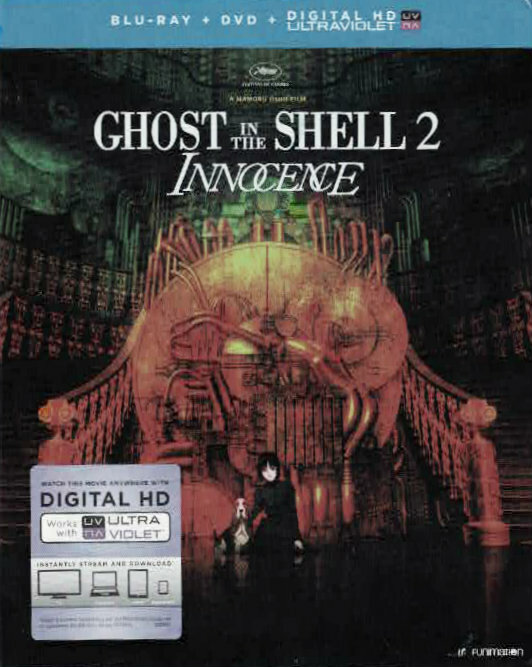 I cannot speak for the new theatrical Ghost in the Shell movie where Scarlett Johansson portrays the incomparable Major (since I have not seen it yet), but I can tell you that the original Ghost in the Shell anime film that debuted in 1995 is a revered classic. For the sake of this review I am going to pretend the new live action movie does not exist to avoid any and all confusion. When I refer to Ghost in the Shell I am talking about the original movie and nothing else. 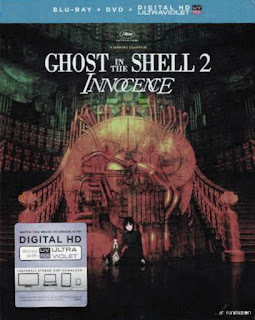 Ghost in the Shell 2: Innocence is an anime film that debuted in 2004 and... well, it's not quite a classic. That's not to say it is a bad film, but it is a really strange brew. Normally, sequels that get thrown out in the world nearly a decade after the originals just don't have the same grip. Perhaps it is a bit like wearing the same hat too long. After a while the spark just isn't there and it is best to let the fire die. However, the amount of time that passed in the real world between these films doesn't really hurt this movie. I think the same exact crew handled both movies and the cool thing about animation is you don't have to see the new wrinkles on the voice actor's faces. Bad CGI does do this film some damage, though. I love animation (obviously) and I do not mind CGI if it is used properly and looks visually pleasing, but what I saw in this movie just didn't cut the mustard with me. This does date this movie somewhat. Unlike the original this film doesn't look like it could be made today. The dialog in this movie is dense with obscure (and even made up) quotes, but Ghost in the Shell has always been fairly dense in both plot and dialog. Still, the quotes did seem a bit more obvious and forced this time around. Of course, the biggest thing about this movie is that the mythical Major Motoko Kusanagi is largely absent from this film. I don't want to spoil things, but there's a reason she isn't here and if you watched the original film you know why, more or less. Not having her in this film does hurt it a lot because she's obviously the pulse of Ghost in the Shell and so much of this film is spent hoping that she shows up. So much so that the film doesn't really get to be appreciated along the way for what it really is. I did like the film, though. Batou was the obvious choice to make the new lead for the film and he did fine with Togusa as the support. Batou is the cliched drunken loner and Togusa is the straight-laced family man and they made a fine team. They are not the Major, but then no one is. It's just a pity that almost no depth of character was given to them this time around. The story also isn't quite as complex as the one in the previous movie and it did not quite pack the same dramatic punch, but it didn't leave me feeling let down, either. I just missed the immense depth I felt from the first movie. Sure, I can watch this over and over again and still enjoy it to a degree, but I won't really gain anything from it like I do with each repeat viewing of the original film. All in all, this is a decent entry in the Ghost in the Shell franchise, but it feels more like a spin-off than a true sequel. Perhaps The Adventures of Batou and Togusa: A Ghost in the Shell Story might've been a better title. Thanks for reading my blog. Hope you have a nice day.